This is a really great Calico Farm, Skyline, Two Part, Round, Divided Vegetable Bowl made by Blue Ridge, Southern Potteries. This Bowl measures 8 1/2 inches in diameter and is signed on the back BLUE RIDGE - HAND PAINTED UNDERGLAZE - SOUTHERN POTTERIES, INC. - 12 H. It is in very good condition with no chips, cracks or scratches. The hand painted decoration is all very good. We guarantee items to be as described. THANK YOU. 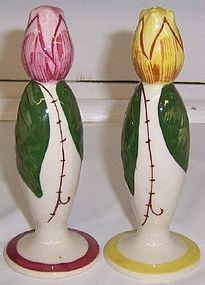 This is a really nice 5 3/4 inch tall Blue Ridge Flower Bud Salt and Pepper Shaker Set made by Southern Potteries, Inc. The Flower buds are pink and yellow. The Shakers are both in really good condition with no chips or cracks. Be sure to see our other Blue Ridge available. We guarantee all items to be as described. Feel free to email with any questions. THANK YOU. 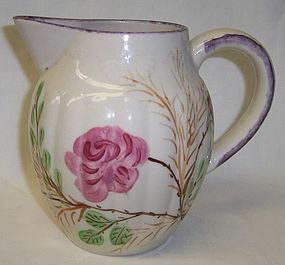 This is a really pretty 6 1/2 inches high Party Goer Virginia Number 1 Jug or Pitcher made by Blue Ridge. The Pitcher is shown on Page 70 of the Frances and John Ruffin Blue Ridge China Today book. The Pitcher is in really good condition with no chips or cracks. It is signed with the Blue Ridge Southern Potteries stamp, but the stamp is blurred. Be sure to see our other Blue Ridge available. We guarantee all items to be as described. Feel free to email any questions. THANK YOU. 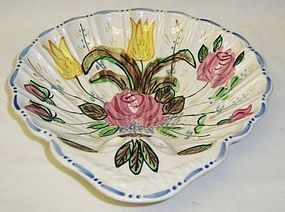 This is a really pretty 8 3/4 inch diameter Nova Rose Shell Shaped Candy Dish made by Blue Ridge. The Candy Dish is in really good condition with no chips or cracks. It is signed on the back Blue Ridge CHINA Hand Painted Underglaze Southern Potteries, Inc. MADE IN U.S.A. Be sure to see our other Blue Ridge available. We guarantee all items to be as described. Feel free to email any questions. THANK YOU. 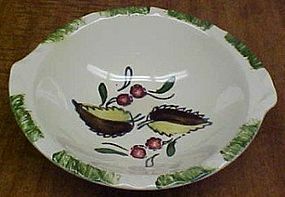 This is a really nice Wild Cherry Number 3 7 inch Tab Handled Soup Bowl made by Blue Ridge. The Tab Soup Bowl is in really good condition with no chips or cracks. It is signed on the back Hand Painted Underglaze BLUE RIDGE Southern Potteries. Be sure to see our other Blue Ridge available. We guarantee all items to be as described. Feel free to email with any questions. THANK YOU.